My choice this morning was between watching the Windsor Wedding on TV or reading the city of Albany’s Capital Improvement Plan for 2019-23. The CIP won. And I learned a thing or two. For one thing, the city’ plan calls for repaving the notoriously bumpy 10 blocks of Fifth Avenue between Lyon and Main streets. That’s the good news. The bad news is that this won’t happen until fiscal year 2022-23. Also, though, the plan projects paving projects on a bunch of other streets that are in much better shape. And they’ll be done sooner. Salem Avenue is one example. It’s a pretty smooth road, allowing lots of traffic to move along at a brisk speed. 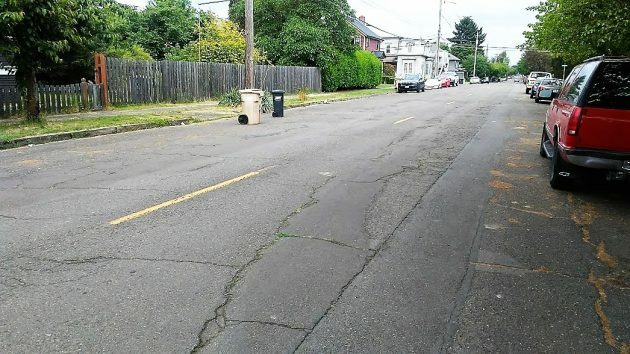 From the Union Pacific track northeastward past Waverly Lake and on to the city limits, Salem Avenue is planned to get a “2-inch asphalt grind inlay” as early as next year, in the 2019-20 fiscal year. Why spend money on streets in fairly decent shape well before repairing the ones that are really bad? 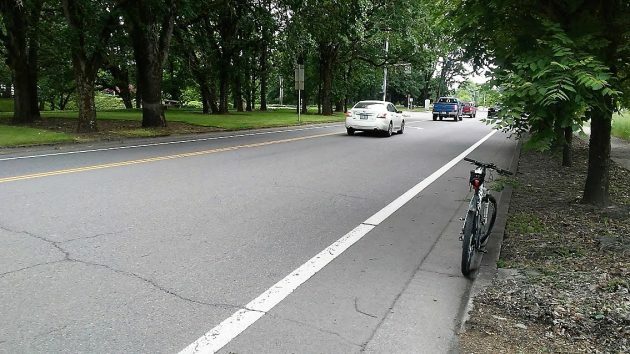 Because the city wants to keep the major roads, the ones carrying a lot of traffic, like Salem Avenue, in pretty good shape so they don’t break down to the point where repairing them would be much more expensive. It’s hard to argue with that approach. But it does explain why streets like Fifth, relatively little used, get so bad before anything is done. Throughout this plan — relatively dry reading compared to the ceremony in England, I’m sure — the city engineers and managers make the point that all the money needed to properly maintain the streets and other systems, such as storm drainage and parks, just isn’t there. So the city is falling further behind with every passing year. If you want the grim details, turn off the TV and read the plan, especially the introduction by City Manager Peter Troedsson, here. What Albany — and other cities in the same boat — should have had for the last generation or two is a rigorous system of funding depreciation. So that when something needs fixing, the money’s there to fix it. Pavement is in rough shape on this segment of Fifth Avenue east of Lyon Street. Whereas Salem Avenue, scheduled to get repaved sooner than Fifth. is in fairly good shape. Royal wedding was great and took my mind off Trump, nationally, and the city of Albany, locally. Would have been better if we had been able to get rid of Wes Hare sooner, but Sharon Konopa worshipped him. Maybe even CARA would have done more practical things with Troedsson at the helm. “What Albany – and other cities in the same boat” need is leadership (aka council) that is practical, thrifty, and an annual change of membership!!! This present City Council is so entrenched that they’ve gotten an aura of being divine beings w/o any feelings of wrong doing. And quit bashing Trump. He’s no political party lacky! He speaks his mind as I do. You liberal, social democrats are a bunch of sour grapes whining!!!!! We put up with (8) years of your Obama in office so put up with our years of a real Man/Leader in office. And as the ‘ole song goes “Praise The Lord And Pass The Ammunition”!!! The money to maintain the streets isn’t there? Maybe it’s time for the Council to examine city budget priorities and give the streets some overdue attention before other gingerbread projects. The council does exactly that. It all starts and hinges on the city’s 5-year Strategic Plan from which the budget is derived. The actual budget is the culmination of taking the Strategic Plan and working it down to the $$ available – knowing full well not everything can be accomplished in one fell swoop. The CIP is an excellent tool by which the infrastructure fixes, repairs, improvements are managed. The items Hasso mentioned have been on the CIP for several years and have been working their way to the top of the priority list — as funding comes available. And your so called “gingerbread projects” are items that make many folks want to stay & live in Albany. Good luck convincing the Mayor, the council, and the budget committee to set aside cash in amounts equal to an asset’s depreciation each year. This is not a new idea. A few citizens have suggested this approach in the past. It always fell on deaf ears. Funded depreciation (for roads, buildings, equipment) takes political will and discipline, something Albany government has been lacking for at least 25 years. City Hall would rather saddle Albany citizens with new taxes, fees, and/or debt. Like I said, deaf ears. Albany residents are unhappy with their crappy roads. The problem begins and ends with Albany’s council, not what other councils in other cities are doing or not doing. Your constituents deserve your full attention on the problem (and solution) Hasso identified. No rundown, no links from “No shade” Shadle. No surprise. Actually, it all begins and ends with $$$$$. Who pays? Your point about planned prefunding has merit fiscally, but likely won’t fly without social re-engineering. The voting electorate has not shown interest in taxes for future work. want to see how bad a street can get with no maintenance? Drive down Fir Oaks Dr SW off SW 29th. It is one of two main roads into the entire SW Subdivision. [mind you there are some pretty expensive homes in that area – ie taxpayers]. It looks more like a cobblestone road than a paved street. Our car would bottom out going into our driveway from the street due to the erosion of the pavement. I live on Fir Oaks which leads into some of the wealthiest homes and our road is worse by 100x than Salem Avenue. pIcture is posted on facebook comments.